On the elevation chart, there doesn’t seem to be a lot of elevation, but if you take a closer look you’ll see that there were a lot of ups and downs. It was in the mid 40s all day and with the damp mist and on again off again rain, we all wore our rain jackets and umbrellas most of the day. We LOVE the hands free setup on the umbrellas. Rockin’ posted a ‘how to’ on her umbrella strategy recently and I use one posted on Rambling Hemlock’s page. It made the day really enjoyable despite the conditions! Great for sun protection too. 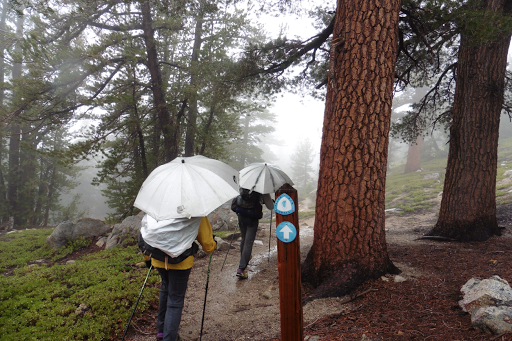 You can get these umbrellas online from various vendors including Gossamer Gear. 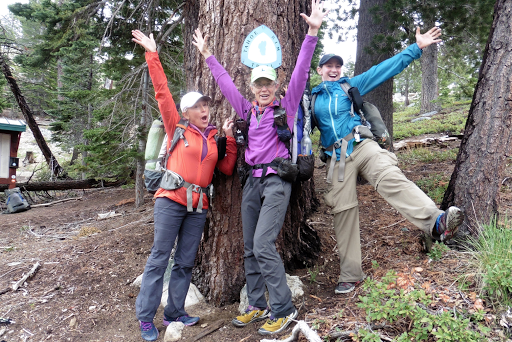 We all found this to be a fitting ending to our Tahoe Rim Trail hike. In the last 9 days, we have had just about everything and a day in this mist and fog was something new to add to that list. Being from the Northwest, I always find this weather to be mystical and appreciate the scenes it produces. 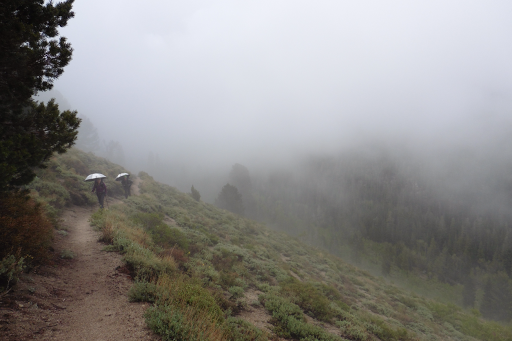 It’s unique for a day on the Tahoe Rim Trail to be completely socked in like this all day this time of year. It felt like fall. Hard to believe we were in 80F weather two days ago swimming in a lake! I love this switchback vantage point of Rockin’ and Why Not. 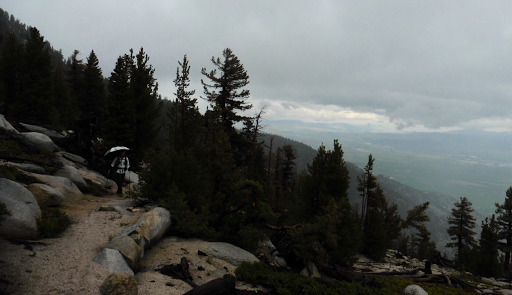 We know there must have been a view at the top of this pass near Freel Peak…darn! Why Not hikes out here all the time and said the views are gorgeous. I guess I have something to come back for! We just barely made it to Star Lake in time to sorta see something. 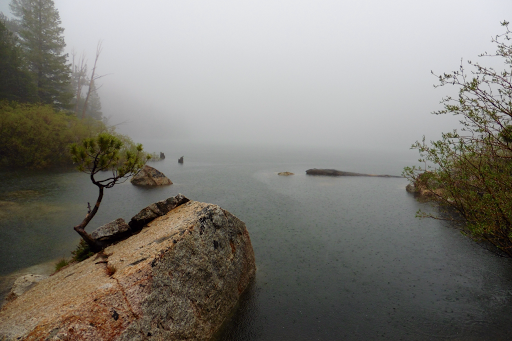 As we hiked down to the lake, the fog moved in and completely covered the lake. You can see how hard it was raining on top of the lake. 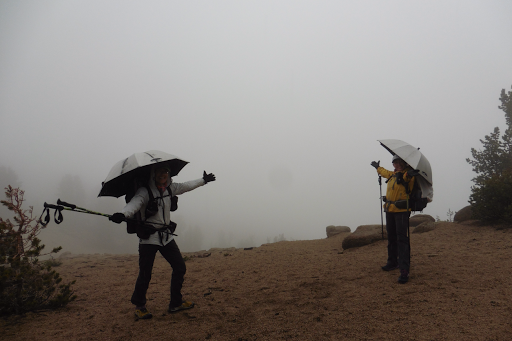 We all smiled all day that we had these umbrellas and imagined how miserable we’d be in rain jackets that would have been soaked or leaked through after 10hrs of hiking. In the last two hours, the clouds started to lift a bit. We even got to see a green version of Nevada off to the east. 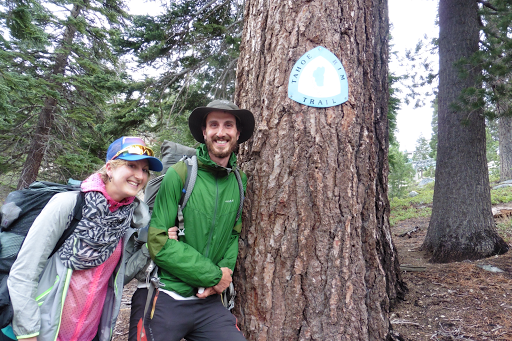 When we made it to the trailhead to complete our loop, there was a PCT thru hiker named Big Hunk there taking some time off trail to do some of the TRT with his girlfriend Karen. Coincidentally, he was also from Portland. It was great to take a start photo for them and we had someone there to take a finish photo for us. Love how those things work out! On the drive back, the rain stopped and the misty clouds remained. It was like we were in the Northwest as we drove around the southern part of Lake Tahoe towards Sacramento. Why Not says it never looks like this around here and it was the best sunset I’ve seen since I started hiking in late March. 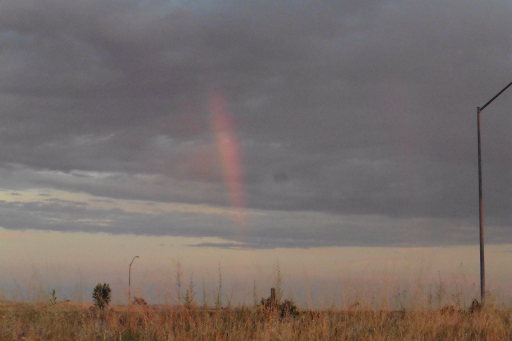 At one point, just as the sun was on the horizon, a rainbow appeared! My last hike (the Hayduke) ended with a rainbow on the drive out on the final day too Such a great sign! I barely caught a photo of it when I was able to get off at an exit and pull over. We are now at Why Not’s house for a zero near Sacramento. Tomorrow, Rockin’ and I will drive to the Coast to meet Drop-N-Roll, LoveNote, and Rockin’s husband for the Lost Coast Trail. Then the Redwoods for a couple days before I head up to Portland for a week break before a brief hike on the Continental Divide Trail and then directly to the Great Divide Trail in Canada. 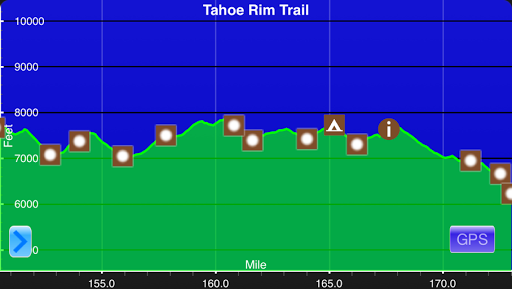 I will say that the Tahoe Rim Trail really impressed me! It is a great short trail to do with the full spectrum of challenge and scenic variety. I was surprised at the amount of variation we had and I know some of it is because we went early in the season. On a “normal” year, there would have been a lot more snow on the trail this early. 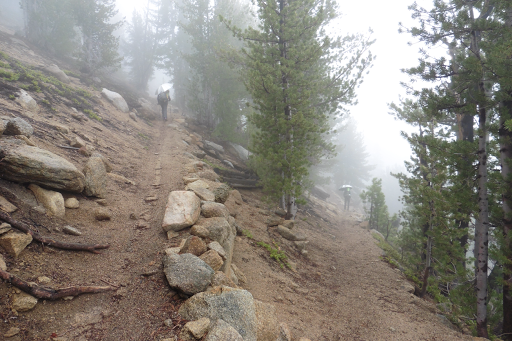 Also, the early hike gave us some of those winter conditions we experienced with snowfall and more rain. We all thought it was great and it kept us on our toes the whole time. I was worried we’d be bored and this earlier hike gave us the solitude we wanted with the challenges we enjoy. Be aware that there are long water carries of ~15mi or more on the east side of the lake, so there’s a challenge for many backpackers. There are many trailheads around the lake, so there are also options for caching water or getting off if/when needed. 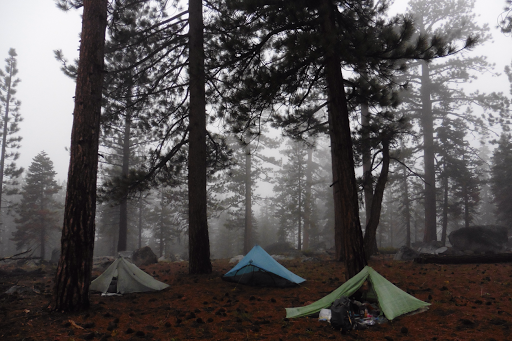 I know many people take two weeks or more to do this trail and it’s a great thru hike to do. Highly recommended! First, I want to say how much I appreciate your blog and all its useful and inspiring content. I am planning on hiking the TRT this summer and I have one issue that I can’t decide on. Do you think I need to bring a bear canister for my through-hike or would I be ok with an Ursack & Opsack combo? What did you and your friends do to keep your food safe? Looking forward to your reply.